"Steel workers speak out." Photo published in "A.D.," January 1981. Change was in the air when our family returned to the U.S. in the Spring of 1972 from Manila. The demise of American manufacturing was becoming a national preoccupation. The loss of the U.S. industrial base, and the jobs that went with it, was especially hard-felt in Chicago, where I was to lead the Institute on the Church in Urban-Industrial Society (ICUIS). The Institute was a part of the United Presbyterian Church in the U.S.A.’s Program Agency, the forerunner of today’s Presbyterian Mission Agency. A First National Bank of Chicago study from that time showed that 325 manufacturing firms had left Cook County between 1970 and 1977, with a net loss of 151,000 manufacturing jobs. Some industries had closed, some had moved to more favorable labor climates in the U.S. southern and Plains states, and others had moved to non-unionized overseas locations. In this new context, the McCormick Seminary-based ICUIS (which was affiliated with the World Council of Churches and the Presbyterian Institute of Industrial Relations) set out to assess the impact that global political change was having upon the church’s role in the world economy, beginning in our own backyard. United Auto Workers advertisement, Chicago Tribune, January 11, 1984. Collected in the Richard Poethig Papers at PHS, 00-0724. ICUIS began tracing, researching, and reporting on the economic dissolution happening within the Rust Belt region around the Great Lakes. The steel industry was our beginning point. Major U.S. steel operations had been challenged by the industrial changes taking place in Asia and South America. The steel industry was one of the first sectors developed in newly industrializing economies. Not only was steel crucial to the consumer sector of a developing economy, it also provided an avenue to compete on the global export market. Our clarion call for action came in September 1977, when the Youngstown Sheet and Tube Co. shut down its Campbell Works in Youngstown, Ohio, with a resulting loss of 6,000 jobs. The reaction in the religious community was immediate and brought into being the Ecumenical Coalition of the Mahoning Valley, a cross section of the religious and community leadership of the Youngstown region, with representation from Cleveland in the presence of the Protestant Episcopal Bishop. Within six months of the closure of the Campbell Works, the leadership of the Coalition had organized a “Save Our Valley” campaign with the creation of a savings account to buy out the Youngstown Sheet and Tube Co. and establish a worker-owned and worker-managed corporation. “Save Our Valley” drew support from national church offices in New York as well as local contributions from Youngstown congregations. The campaign’s savings account reached over $4 million. As the Youngstown situation was unfolding, South Chicago faced its own major steel plant shutdowns. On March 28, 1980, Wisconsin Steel Company unceremoniously shut its doors. Suddenly, without previous notice, 3,500 workers were thrown out of work. The troubles at Wisconsin Steel, which had gone into bankruptcy, was indicative of the steel industry across the Midwest. U.S. Steel, which had a neighboring plant in South Chicago, put 5,000 of its workers on furlough. Nearby, the financially sound Inland Steel put its 5,500 employees, blue collar and salaried alike, on a four-day week. In the greater Calumet region, 125,000 jobs were related to steel production. The losses within the industry sent shock waves through the wider community. Churches were directly affected by the loss of jobs among their people. Following our experience with the Youngstown Sheet and Tube situation, ICUIS responded immediately to the steel shut-down close to home. Besides our reporting on the Wisconsin Steel closure and its impact on the work force, Fr. Tom Joyce (of the Eighth Day Center, a Roman Catholic social activist group) and I sought out one of the main religious actors in the Calumet region, Fr. Leo Mahon of St. Victor’s parish. Fr. Leo Mahon had previously served in Panama and had been active in the communidad de bases (or grass-roots) movement. Publication by the National Conference of Catholic Bishops. Collected in the Richard Poethig Papers, 00-0724. Fr. Leo was ready for action, and on June 10, 1980, he called together twenty pastors, priests, and community workers from the Calumet region at St. Victor’s Church. Out of the St. Victor’s meeting two goals were set: (1) gather information on the state of the steel industry in the Calumet/Gary region and (2) organize the religious community to keep the human issues front and center in the ensuing steel crisis. The next step was to call a larger community meeting, bringing together all the major actors in the steel community: the management of the mills, labor union leadership and “on the line” workers, representatives from government, and the religious leaders in the community. The community meeting was held August 23 at Calumet College. Over 125 steelworkers, community workers, and clergy gathered to hear the presentations of the congressional representative of the region, the U.S. Steel Workers (USW) local president, the Inland Steel management, and the community’s unemployed. The meeting resulted in the creation of a congregation-based organization aimed at increasing local citizen’s participation in the economic decisions affecting the region. 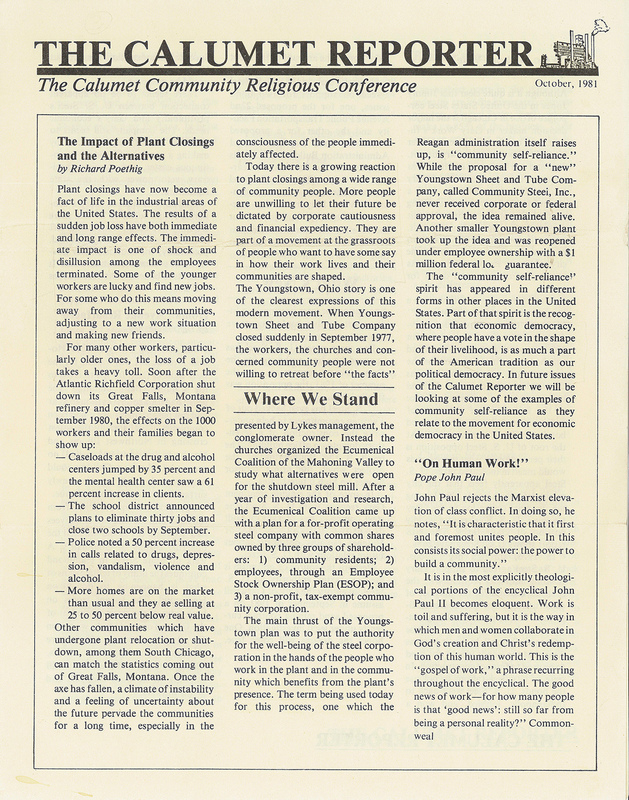 A follow‐up meeting in September brought into being the Calumet Community Religious Conference on the Steel Crisis (CCRC), a group that counted among its members representation from Roman Catholic, Presbyterian, Methodist, Lutheran, Baptist, and Muslim congregations. Ensign Leininger (the pastor at my family's Calumet congregation) and I were appointed by the Presbytery of Chicago as its official representatives. Among the CCRC’s goals was to alert the community to the seriousness of the crisis in steel and the threat it posed to the area’s economic and social wellbeing; bridge the interests of labor, industry, and government (and in the process move from adversarial to cooperative relationships); encourage original analysis and collation of the research by community organizations, industry, government, unions and universities; and provide a headquarters, staff, and resources to achieve the above goals. The CCRC hired two people to organize the religious community: Roberta Lynch in South Chicago and John Beckman in the Gary/Hammond area. 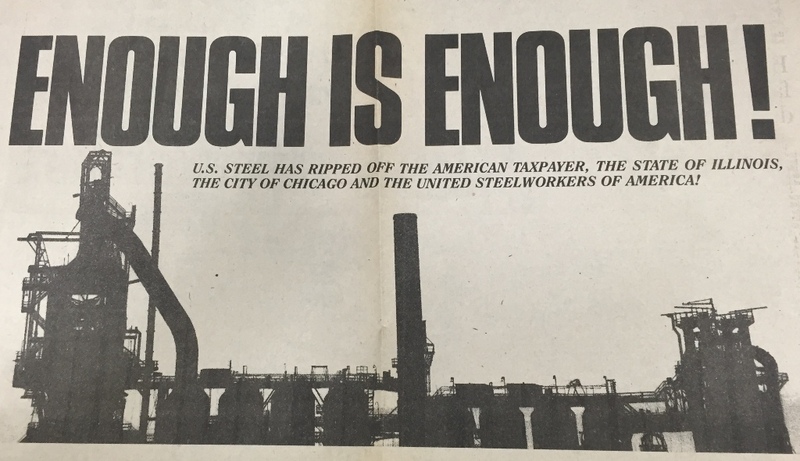 As the organizing campaign got underway in 1981, the CCRC concentrated on five objectives: (1) a mortgage protection campaign to prevent the unemployed in the region from losing their homes; (2) a campaign to have the steel companies make public commitments to remaining in the Calumet region; (3) federal assistance for the modernization of the existing steel plants; (4) state legislation calling for advance notice of a plant closing, extra severance pay, a community fund for retraining the unemployed, and aid for medical insurance; and (5) the creation of a community services center to provide emergency food and clothing, housing counseling, job information, and counseling for emotional problems. Front page of The Calumet Reporter, October 1981. 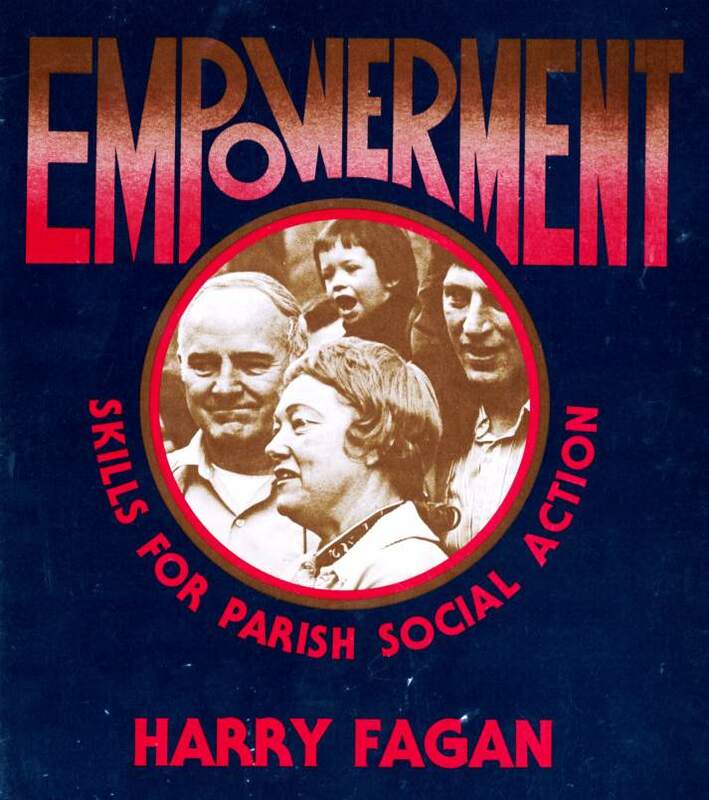 The impact of the loss of jobs in the steel industry continued into 1982 as CCRC worked to encourage local congregations to take action on behalf of the unemployed in the community. By June 1982 it was decided that CCRC needed a stronger education/action base to encourage wider congregational participation. A letter from Jerry Kellman, a community organizer hired by the archdiocese, pointed to just such a program already begun in Catholic parishes in Chicago’s Hispanic neighborhoods by the Latino Institute. He suggested that a similar approach might be made in the Calumet region. Kellman laid out a five‐year plan that would work intensively within the parishes to build a congregation-based organization to take common action on the issues facing the people in the Calumet region; the plan centered in developing Catholic parishes in a bi‐state project. The initial funding for the Latino Institute oversight had come from the Chicago diocese. After the Catholic parishes got on board, the next step would be inviting Protestant congregations to participate. The intense organization campaign began in 1985, around the time when Kellman ran an ad in the New York Times looking for an organizer to work in South Chicago. A recent Columbia University graduate named Barack Obama submitted an application. Kellman, a Presbyterian before he became a Roman Catholic, interviewed Obama and offered him the position as an organizer in the Roseland area. Barack Obama went to work as the organizer in the Developing Communities Project, an offshoot of the CCRC. He concentrated his efforts in the Altgelt Gardens housing area. 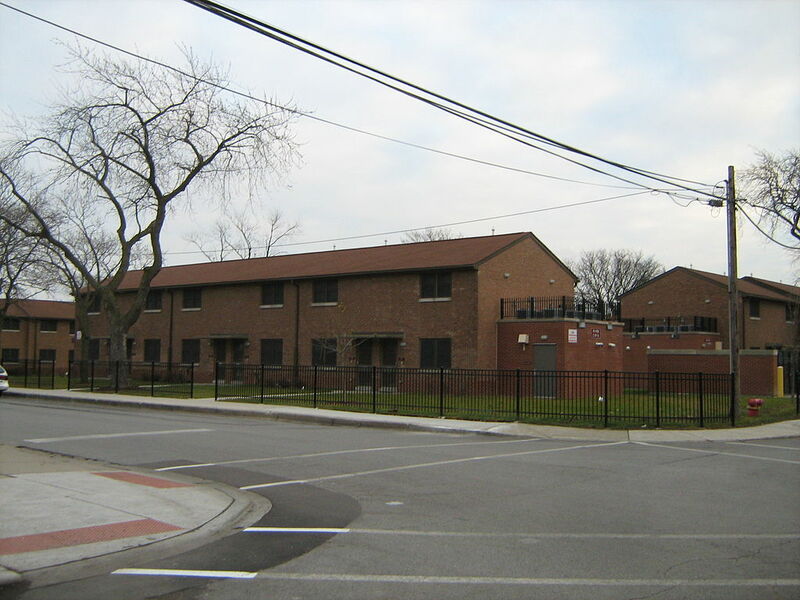 Altgelt Gardens Homes, 2009. Via Wikicommons. The underlying issue of job loss in the Midwest Rustbelt drew together communities across the Great Lakes region, and a call went out across the region for a more comprehensive approach to the conditions in the steel and related industries. In late 1984, regional representatives from Buffalo in western New York, across western Pennsylvania, and through Ohio and Indiana and into Chicago came together to form the Ecumenical Great Lakes/Appalachian Network. I am intensely proud of that group’s work, and of the work carried out by ICIUS, CCRC, PIIR, and the Latino Institute. Not only did such organizations foster the creation and growth of community-based groups that helped people adjust to a changing global economy, they served as training grounds for a new generation of community and political leaders--inside and outside faith-based groups. Today those leaders continue the tradition of confronting systemic problems and providing for the most vulnerable in society, in Chicago, Youngstown, and beyond. Among their ranks is a soon-to-retire American President, and--who knows?--maybe a future one we just haven’t heard of yet. Further Reading: Learn more about Labor Rights in Chicago in the "Back in the U.S." section of www.richardpoethig.com, under "Organizing for Change: Part 2."